We are a market research company that specializes in helping researchers and marketers survey real life people. iGlobal Surveys offers surveys which can range from questionnaires about products you use every day to purchasing decisions you make. 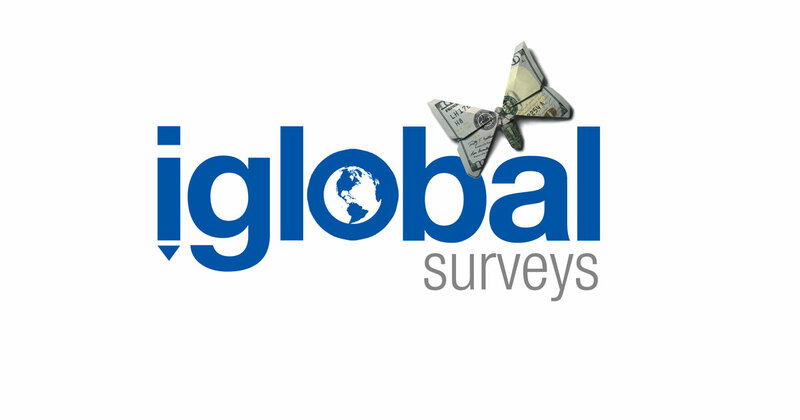 Here at iGlobal Surveys, we strive to give our survey members the best survey experience possible and we pay you for every survey you complete. How we can pay you to respond to survey questions? Companies, governments entities, and industries all over the world want to hear your opinion on the services and products you use every day. Companies want to test ideas on small target audiences before spending millions on creating and marketing products. Government entities often want to test campaign messages to discover how effective they are. Organizations want to find opinions on many topics. Researchers and marketers come to us to reach specific people and demographic groups, based on their research needs. We specialize in finding people who are willing to participate in any of these research studies. We receive money for maintaining this panel of potential respondents. We email you survey invitations with an estimated length of time for each survey and the amount you will be rewarded for completing it. By sharing your opinion, you become the key to helping decision makers make informed choices. iGlobal Surveys is an easy way to share your valued opinion, shape the world around you, and get rewarded for your personal insights and opinion. Joining is free and easy, and participation in surveys is simple. To sign up, you will answer some basic questions that will take less than a minute. You will then start being invited to take surveys that pay you for your participation. We will send you survey invitations via your email, and you can control how often you get survey invites. You can cancel or pause your membership at any time. After you join, there are sets of questions we call Profiles that ask you more detailed questions. You can fill these out immediately after signing up or wait to answer them. We use these additional questions to help send you surveys that are targeted specifically toward you (for example: products and services you use). Filling these out will usually help you get even more opportunities to participate in paid surveys. We want you to share iGlobal by referring your friends, family, or colleagues to us and inviting them to take part in getting paid to take surveys. When you refer other people to iGlobal, you make money on every completed survey they take. This method is better for you because you get paid more over the long run. Our referral program is not just for large corporations who use networks of websites to get people to join. We are looking for honest people who are willing to refer a few people they know. With iGlobal, referring is simple and works a few different ways. You can refer people to us by emailing your contacts, writing a review of iGlobal on your blog, or sharing your referral link through a social network like Facebook or Twitter. You can connect with social networks or use the pre-made banners that we provide to post to your blog or any other web page. We also give you options to help track which methods work best for you and provide the most referrals. We offer a campaign tool that will show you which methods are most effective depending on how you want to refer people to the site. If you are already a survey member, you can simply sign up for our referral program (click “Sign up to Refer Only” below). If you haven’t joined iGlobal yet, you can choose to participate as either a survey member or a referral member, or in both programs we offer. We are a passionate group of individuals trying to change how the survey industry works. We are based out of Phoenix, Arizona and have people working around the world to bring you our website and services. Our mission is to help bring a better user experience to survey participants. We do this by listening to our members and improving our technology and processes. If you have any other questions, please visit our support page to find our frequently asked questions and answers or to contact customer support.